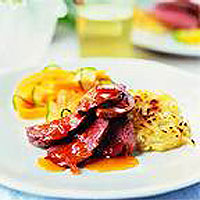 Duck is rich in iron, which prevents anaemia and boosts immunity. Protein is used by the body for growth, repair and muscle tone. Vegetables have beta-carotene in plenty, an antioxidant vital for general immunity and wellbeing. Boil the potatoes for 10 minutes. Drain and leave to one side. Place the duck breasts, skin-side up, under a high grill and cook for about 15 minutes, depending on whether you prefer the meat pink or better cooked. Turn off the heat and leave the duck under the grill until you are ready to serve it. Meanwhile, place the courgettes, carrot and peppers in a non-stick or heavy-based pan with a lid, then add the orange juice. Simmer the vegetables, covered, for about 7 minutes or until cooked to your taste. Remove from the pan using a slotted spoon or fish slice, reserving the orange juice, and keep warm until you are ready to serve them. Grate the partly cooked potatoes using a rösti grater or the largest side of a cheese grater. Heat the oil in a pan and press the grated potato into the pan, either as one round or as individual potato cakes. Fry over a medium heat for about 7 minutes until the underside is browned. Place a plate over the pan and invert it so the rösti rests on the plate. Return the rösti to the pan, uncooked-side down, and cook for a further 5 minutes. Stir the marmalade into the reserved orange juice. Turn up the heat and cook for about 5 minutes until the sauce has thickened and reduced. Remove the fat from the duck breasts and slice the flesh thinly. Arrange on preheated plates and spoon the marmalade glaze over. Serve immediately with the vegetables and rösti.